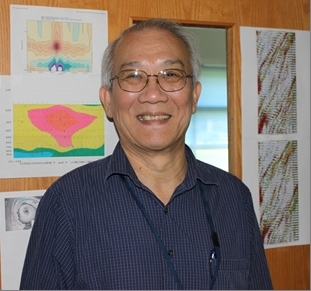 Q & A with NHC - Jiann-Gwo Jiing, Ph.D.
Did you have the defective weather gene, and did it blossom early? I have no idea how I got into this field! I was at a meteorology conference, and everyone around the table was telling their story of when they were kids that a hurricane went by and they decided this was the thing they wanted to do when they grew up. I grew up in Taiwan. There were typhoons every year! I remember one typhoon where the eye was right on top of us. My brother and I went out in the calm and chopped up papaya trees. It must be in your DNA then. It has to be genetic. I got my Bachelor of Science Degree and Masters Degree in Atmospheric Science in Taiwan. I applied for a research assistance position to several U.S. universities, and the University of Miami offered a position to me. It had some famous professors there at the time, and I thought it would be great place for tropical meteorology. It was on easterly waves. I did my dissertation on it. How did you get from the UM to the National Hurricane Center? I had visited NHC several times when it was in the old building in Coral Gables, but I actually took a job first in New York City at City College, and taught there for four years. After that, I happened to walk into NHC, and there was Jim Gross. He and I had the same mentor at UM, so we had known each other for a long time. He asked if I would be interested in working in the Tropical Satellite Analysis and Forecast (TSAF) unit there. He took me in to see (NHC Director) Bob Sheets to discuss it. I was hired as a meteorologist/forecaster in the TAC and did that for five years. Then, sometime in 1994, the Weather Service created the position of "Science and Operations Officer" (SOO), and I became the first SOO at NHC. I held that position for almost six years. Now I am the branch chief of NHC's Technology and Science Branch (TSB). That's very different than hands-on day to day forecasting. It's quite different, although my interest is still there of dealing with the real-time data, as much data as I can put my hands on. That's the part that is most attractive to me. I see you running from place to place and meeting to meeting. It seems a greater challenge in support today than ever before. I would agree with that, and it is getting more and more challenging in the sense that technology is improving rapidly and we need to catch up. With the computers and the scientific application part of them, something new could come out that could improve your forecast or your analysis. You want to get your hands on that to see if that really is the case, and bring that into operations to make a better forecast. But at the same time, because of the small staffing size that supports the different areas in our operations, it takes a lot of resources just to keep things running and the data flowing. It's keeping the talent here. It's a unique problem here to some extent because of the nature of the work. It's very specialized. And we actually support other offices, such as the Central Pacific Hurricane Center, for their hurricane forecasts. We want people coming here with the most skills that can be found and have interest in this area. And you have to invest a lot in them to get them trained. The biggest challenge as a manager is how to keep your employees happy and still. You either do it right or you don't do it right. But some factors are just not in my control. I have access to all of the data, all of the observations, any new type of platforms. I still have an interest in finding things. A recent example was a potential typhoon forming over the western Pacific Ocean. I remember seeing something coming across the eastern Pacific Ocean. I put together a diagram of a model field, and I could see the seedling coming from the eastern to the western Pacific Ocean. I still enjoy being involved in all of that. Are you able to turn it off when you walk out the door at the end of the day? No, not as a manager, I just can't. Not even in the middle of the night. Something will wake me up and I will not be able to get back to sleep. Where you do see yourself in five years? I don't have much right now. It depends on how things evolve during the next few years. Maybe doing some farming. And fishing!